The penthouse suite at No. 284 has an atrium glass roof and private terrace. You could easily walk by No. 284 and not realize it’s one of Boston’s newest boutique lodgings. 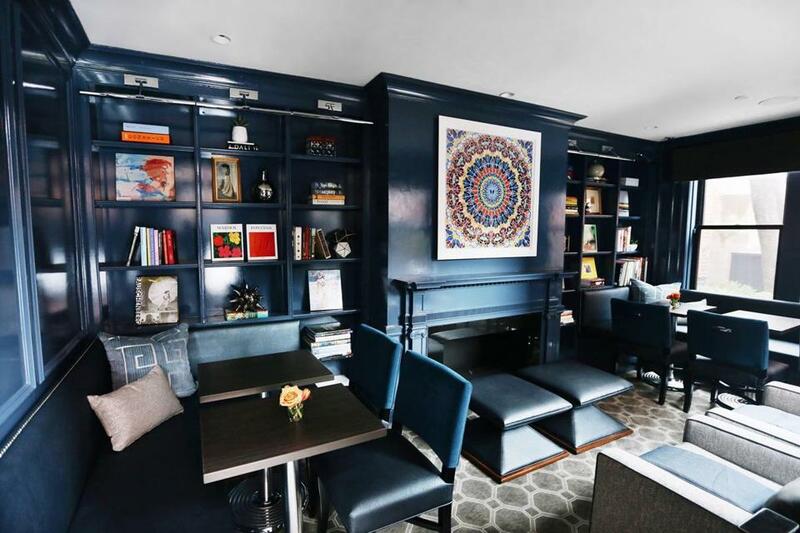 It is the epitome of understated elegance, a serene, luxurious oasis, steps from bustling Copley Square, that feels more like home than hotel. That is if your home happens to be a stately, six-story, 19th-century brick townhouse, filled with original art, 23 stylish rooms, and a coddling staff at your disposal. The new, snug library has built-in shelves filled with art books. 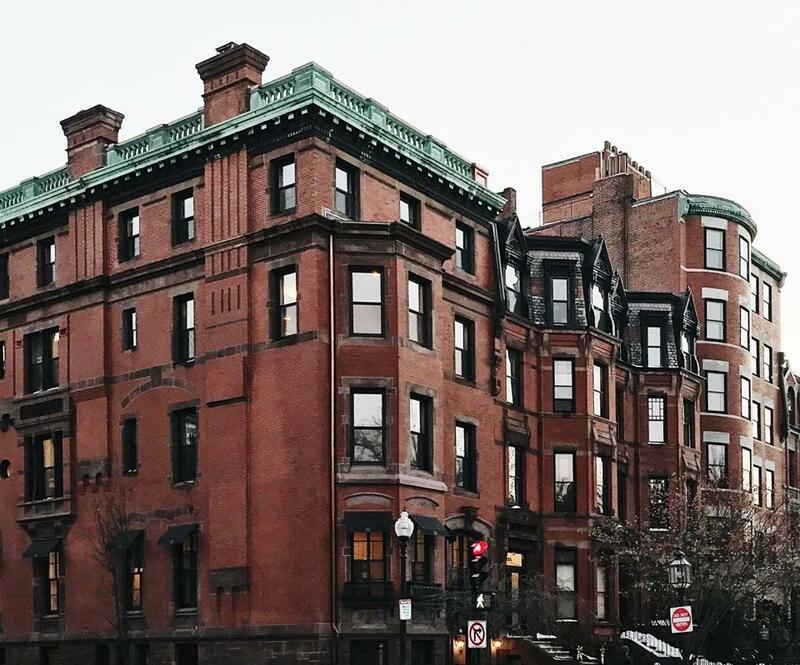 The former private residence, located in Back Bay at the corner of Commonwealth Ave. and Gloucester, underwent an 18-month, multi-million-dollar rehab that managed to preserve the building’s historic charm while adding loads of modern luxury. Wood front doors open to the ground floor foyer and staircase, with original woodwork, now painted glossy black. There is a small, help-yourself snack and beverage area, and a new, snug library, with contemporary, custom-made tables, chairs, and booths, and built-in shelves filled with art books. What we liked best: the private outdoor brick courtyard. It was closed when we visited, but we can imagine sitting there on a warm summer evening enjoying pre-dinner drinks and conversation. No. 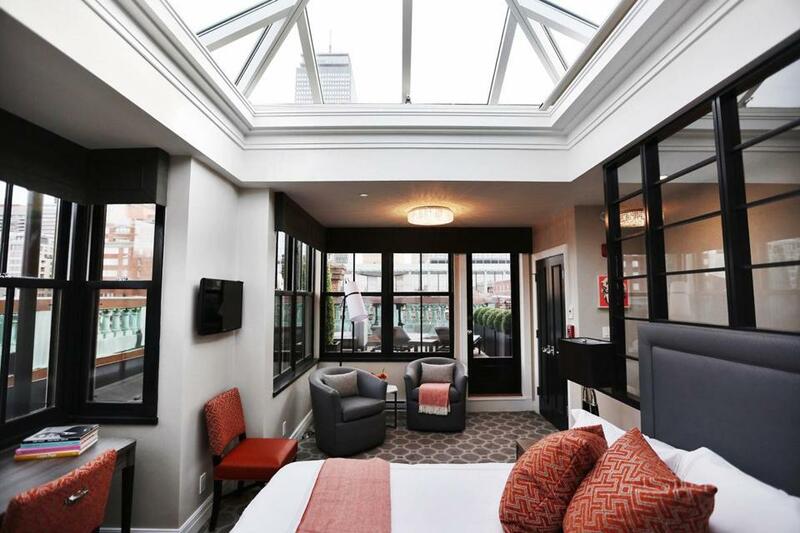 284 is one of Boston’s newest boutique lodgings. Rooms come in varying sizes but have all been updated. Interior designer Sharon Cameron Lawn didn’t think too far out of the box: There are neutral gray and white palettes punctuated with a touch of blue here, a touch of orange there. A dimensional lattice-like contemporary wall behind the headboards adds interest, along with original details like ornate woodwork, wall paneling, fireplaces (lower floor suites have working gas fireplaces), and bay windows. Most rooms are bright with lots of natural light, with either views of Hancock Tower and Back Bay or Commonwealth Ave. Private baths are all brand new with glass showers and marble tile, and each room has a small kitchenette area, with a glossy white cabinet housing a mini-refrigerator, providing another homey touch. High-end Elemis toiletries, Frette linens, and high-tech bells and whistles provide modern convenience and added luxury. Art plays a major role in the design and concept of No. 284. Each room is named after an artist and includes a book on the artist and an original piece of his or her work. Internationally known art consultant Kate Chertavian, who specializes in modern, postwar, and contemporary art, curated the predominantly American collection, spanning from 1880 to 2017. The art progresses through the years as you climb the stairs, moving from abstract to contemporary. Pablo Picasso’s 1914-15 cubist etching “L’Homme au chapeau” hangs in the foyer entrance. Ground floor guestrooms feature prints from Boston-born American Impressionist Childe Hassam. Other artists include Stanley William Hayter, Jasper Johns, Robert Rauschenberg, and Jim Dine. The collection culminates with an iconic Marilyn offset lithograph by Andy Warhol hanging at the top the staircase leading to the penthouse suite. Ahhh, the penthouse suite: It’s gorgeous, with an atrium glass roof and private terrace. We could definitely live here. 284 Commonwealth Ave., 617-603-0084, www.no284.com. Rates start around $350.